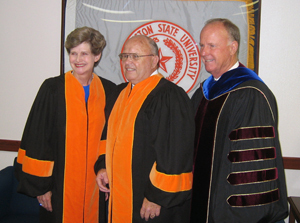 Visiting prior to Saturday's summer commencement exercises were, from left, commencement speaker Jane Monday, SHSU Regent Jimmy Hayley, and SHSU President James F. Gaertner. After years of classes in public schools and at Sam Houston State University, on a day they thought they were just showing up to get a diploma, some 750 SHSU graduates got five additional "Lessons from Sam." Jane Monday, past Huntsville mayor, former SHSU regent, and a person introduced by SHSU President James Gaertner as one who has "put on her jeans and helped decorate the Coliseum," was the teacher/speaker for five points from General Sam Houston's life. Monday spoke at ceremonies at 10 a.m. and 2 p.m. in Johnson Coliseum. Her first lesson was "A Life Long Love of Learning." "When Sam was growing up his father had one of the finest libraries in Virginia and Sam was constantly found reading the classics like Homer and Vergil," said Monday. "He loved to read about history and geography." After running away from home at the age of 16 to live with the Cherokees, he returned at 19 and was so well read and self taught that he could open a school to pay his debts. "In later life Sam said, 'I experienced a higher feeling of dignity and self satisfaction from teaching than from any office or honor which I have held since,'" Monday said. "Reading and life long learning paid off for Sam." Lesson Two: "Live Your Life Honorably." "So saying," Monday said, "she slipped onto his finger a simple gold band with the word Honor engraved on it. Sam wore that ring the rest of his life." Lesson Three: "When You Feel You Are Down and Out Don't Give Up." After helping his old commander, Andrew Jackson, become U. S. president, and while serving as governor of Tennessee, Houston was thought to be Jackson's likely successor. Houston's failed marriage ruined that, he ran away again to live with the Cherokees, and became known to them as "Big Drunk." "Sam was about as low as he could go," Monday said. "It could have ended there but it didn't because Sam didn't give up." He moved to Texas, where the fourth largest city in the United States and a university are now named for him. Because of his victory at San Jacinto the United States would increase its size by a third. He became president of the Republic of Texas, U. S. Senator from Texas, and governor of the state of Texas. "None of these would have happened," Monday said, "if Sam had given up." Lesson Four: "Have the Courage to Stand for What You Know is Right." As leader of 783 untrained Texian volunteers at San Jacinto, Houston faced a professional Mexican army of 1,200. Five of his seven officers voted to take a defensive position. Sam chose to attack. "Sam called for battle because he knew that his men wanted revenge for the Alamo and Goliad," Monday said, "and in their hearts they would see to it that victory was theirs." His other great act of courage was refusing to sign an oath of allegiance to the Confederacy, and having to step down as governor in 1861. He felt that the South could not win the war, and he felt that slavery was wrong, freeing his slaves even though it was illegal to do so in Texas. "He also offered for them to stay in the household so that they would not be left on their own and told them he would pay them wages as long as he could," said Monday, who co-authored the award-winning "From Slave to Statesman: The Legacy of Joshua Houston," about Houston's close personal servant. "The price of standing for what he believed was high but Sam never wavered and stood by what he believed no matter what the cost," Monday told the graduates. Lesson Five: "Honor Your Family and Country." When he died at the age of 70 on July 26, 1863 Sam Houston still wore the gold band, inscribed with the word Honor that his mother had given him a half century earlier. The last words his wife, Margaret, heard were her name, and "Texas." "Our university proudly bears his name and we want to wish you all the best as you begin your life's journey," said Monday. "I hope in the future when you look at your diploma or at your ring you will think of this wonderful university and know you will always be a part of Sam's legacy and our Bearkat family."